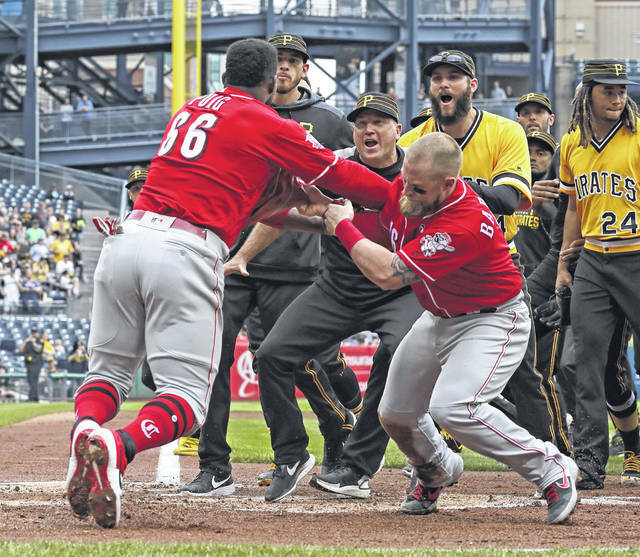 Cincinnati Reds outfielder Yasiel Puig (66) pulls away from Tucker Barnhart (16) and runs into Pittsburgh Pirates bench coach Tom Prince, center, as he attempts to re-enter a bench clearing during the fourth inning of Sunday’s game. “It’s not concern, it’s excitement,” he said. https://www.limaohio.com/wp-content/uploads/sites/54/2019/04/web1_Puig.jpgCincinnati Reds outfielder Yasiel Puig (66) pulls away from Tucker Barnhart (16) and runs into Pittsburgh Pirates bench coach Tom Prince, center, as he attempts to re-enter a bench clearing during the fourth inning of Sunday’s game.